How does the recruitment process work? It depends on the company and what methods the company uses to find applicants for employment. However, most large and some small employers have a formal process that it follows to recruit and hire new employees. Before hiring an applicant for a job position, a company goes through a step-by-step hiring process. This process has three key phases, including planning, recruitment, and employee selection. The recruitment phase of the hiring process takes place when the company tries to reach a pool of candidates through job postings, job referrals, advertisements, college campus recruitment, etc. Candidates who respond to these measures then come in for interviews and other methods of assessment. Employers may check the background of prospective employees, as well as check references. Employee selection is the process by which an employer evaluates information about the pool of applicants generated during the recruitment phase. After assessing the candidates, the company decides which applicant will be offered the position. Some companies work with a recruiter to find applicants, especially for higher level jobs. Other companies will use social networking sites and LinkedIn to recruit, in addition to using traditional means of recruiting like posting help wanted ads in newspapers and social media and listing jobs online like at Indeed.com or CareerBuilder. Many employers, especially large companies, may not actively recruit candidates, but do post open positions on their company website. In other cases, the job application process will require applicants to submit a resume and cover letter via email. Some employers still prefer that applicants apply in person. As part of the application process, candidates may be asked to take a talent assessment test to see if their background matches the company's requirements. Job applications and test results will be reviewed and selected candidates will be invited for a job interview. As candidates move through the interview process, they may be interviewed several times prior to receiving a job offer or a rejection notice. Companies will also run background checks, reference checks, and possibly a credit check as part of the recruitment process. The candidate may be offered a job contingent upon the results of the checks or the checks may be conducted prior to the company presenting a job offer to the candidate they have chosen for the job. Most larger companies, and many smaller companies, post available jobs on their company website. Job applicants can search for jobs, review job listings and apply for jobs online. Job seekers may be able to set up job search agents to notify them via email of new openings. Some companies schedule interviews online, as well. Companies that are actively recruiting candidates will not only post jobs on their website but will also post jobs on job boards and other job sites. Jobs may be posted on general job boards like Monster and/or on niche sites like MediaBistro, for example. Companies may post open positions on LinkedIn, the professional networking site. In addition, companies may search LinkedIn to find candidates to recruit. LinkedIn Groups are another venue that employers use to post jobs and find applicants. Companies are increasingly using social recruiting to source candidates for employment on Facebook, Twitter and other social networking sites, as well as to investigate applicants they are considering hiring. Companies may use Facebook apps to recruit or have a Facebook page dedicated to careers with the company. On Twitter, companies may tweet job listings and source candidates to recruit. Here's information on the entire job application process including applying for jobs, resumes and cover letters, applicant testing, background and reference checks, interviewing, and the hiring process. The interview process isn't a matter of getting called for a job interview, interviewing and getting a job offer. In many cases, it is complex and may involve multiple interviews. 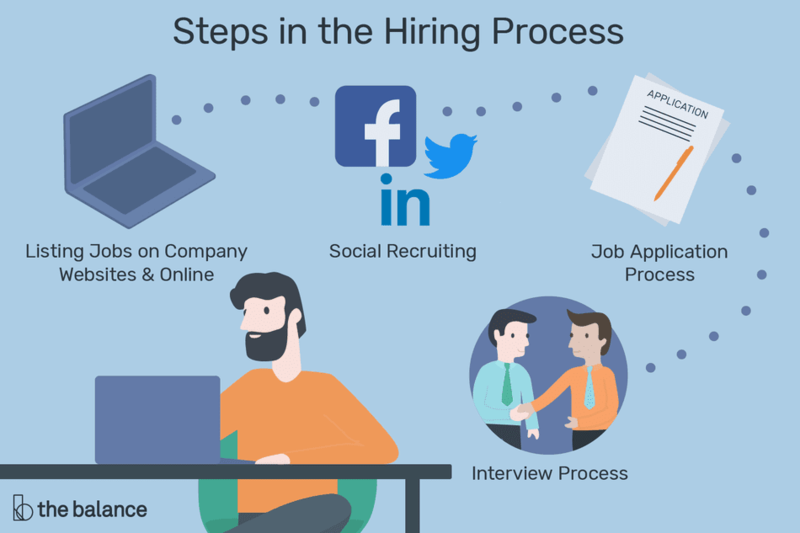 There are a series of steps in the hiring process, including applying for jobs, interviewing, employment testing, background checks, and job offers, along with tips and advice for each step in the hiring process.